7.0" x 3.4" stitched on 14 count. 5.4" x 2.7" stitched on 18 count. 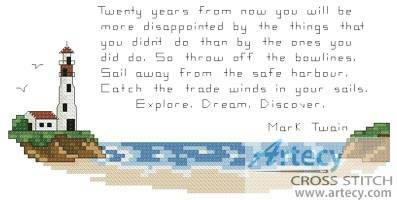 Lighthouse cross stitch pattern... This counted cross stitch pattern was designed by Tereena Clarke of Artecy Cross Stitch. It is of a beach and lighthouse scene with an inspirational quote from Mark Twain. Full cross stitches, Quarter stitches and Back Stitches are used in this pattern.